Last year in November, Madagascar’s capital Antananarivo unveiled a new road, from the northwest of town to the airport. Within three days, workers were filling potholes, and within a week, the road was closed. In the year since, there have been repeated predictions that the road would be re-tarred and reopend, but nothing has happened. But in this year’s extremely rainy “rainy season,” the rice harvest has been very good, and the locals on both sides of the road have taken advantage of the black (partially, at this point) tarred surface. Local rice farmers pull the rice out of the flooded fields, and beat it on a drum (or somethign similar) to separate the rice from the stalks, and the stalks are then tossed aside. The rice (still in the hull) is spread out on a tarp to dry, and later they will use a tray to toss it so the hulls blow away. The hulls are kept for gardening. The stalks are gathered, spread out on the roads to try and then piled into “haystacks.” This is to feed the zebu later in the year. Last year, all the rice farmers had to spread out their rice and straw on the dirt dikes that run left to right in the video. This year, they have this nice black road that gets nice and hot. What will happen if the road ends up getting re-tarred? 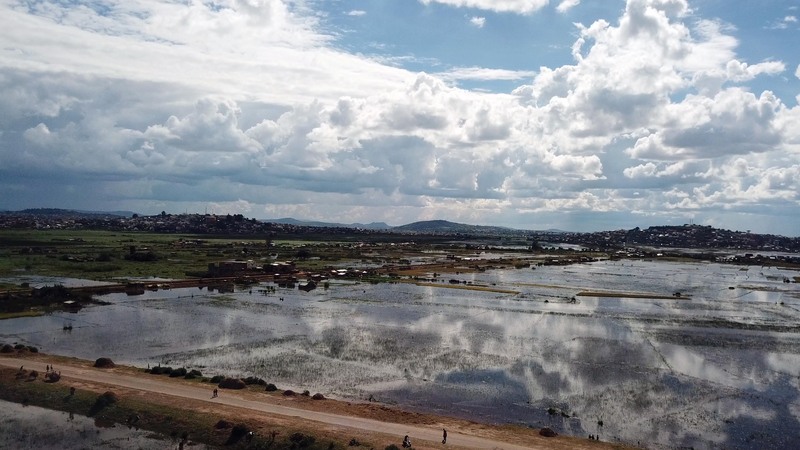 This entry was posted in Aerial photography/videography, Madagascar and tagged airport road, Antananarivo, DJI, drone, farming, Madagascar, Mavic, rice, road, straw. Bookmark the permalink. Great footage Tom, came out really well!! Less rice today than yesterday though?